We previously wrote about a new building at Harry and Webb in Wichita. There is another building going up next to it. Yet, there were no signs or any indications at all about what these buildings were going to be. It crossed our minds to stop and ask the workers what they were building. Sadly, the day we took the picture, it was raining. No workers. Failing. Although we call ourselves detectives, too much detective work would take away from our beer time. Sherlock Holmes, we ain’t. So, we didn’t go back to find out more. We figured eventually, something would tell us what the hell was going on. Our friends at the Wichita Eagle broke the story. Business writer Carrie Rengers dropped the story yesterday. So did food writer Denise Neil. In fact, Denise actually walked up to the workers and asked what they were building! She is a much better detective than we could ever be. We suspect she doesn’t share our alcohol problem! And, a sign just went up in front of the construction site indicating what the buildings would be. Could have used that a while ago, guys! The building is a new Taco Bell! The building next to it will be a small strip center with some retail space, and a Pizza Hut. We said previously that we had our suspicion what the almost completed building (pictured) would be. We thought it was a Taco Bell. The purple kind of gave it away. Plus, the look of the building matches what the new Taco Bells look like. We were right. Winning. Taco Bell is pretty ballsy. There is a local taco chain right across the street called Taco Shop. In fact, Taco Shop recently remodeled. 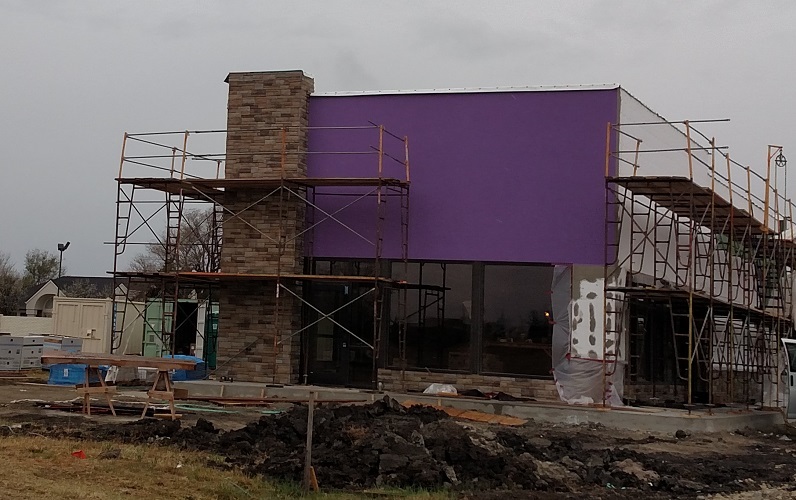 The exterior now features…get this…purple. Did Taco Shop know this was coming? Taco Shop is going to have to step up its game to compete with the almighty Taco Bell, which we think has the best fast food tacos around. We welcome the new places at Harry and Webb. The nearest Taco Bell is at Kellogg and Greenwich. That’s too far to take Taco Bell out to the Harry and Webb neighborhoods. The tacos sog out. And the Pizza Hut on south Rock Road has gone to hell. So maybe a new Pizza Hut will bring back to the neighborhood edible pizza. A big thanks to Carrie Rengers and Denise Neil for being better detectives and reporters than we are!